A young man is a theory; an old man is a fact. The first response that comes to one’s mind is yes, as this economic recovery has been dismal at best and illusory at worst. The unemployment rate might have dropped, but the way the BLS (Bureau of Labour Statistics) calculates this figure is questionable at best. They conveniently exclude individuals who have stopped looking for a job in their calculation. Many of these people stopped looking for jobs out of pure frustration; after trying a countless number of times without success, they simply gave up and assumed they would never land a job. The majority of the new jobs created are low paying jobs and in most cases, they are only part time. Many individuals are working two and sometimes three jobs just to be able to make ends meet; this is not a sign of an improving economy. Over 6.5 million Americans work part-time jobs, but all of them seek full-time employment; before the so-called great recession, only 4.5 million Americans worked part-time and more importantly, we did not waste trillions of dollars trying to create an illusion that all was well. This money could have been put to better use, but it was not, and the same will hold true going forward. Instead of trying to deal with the underlying issues, more money will be flushed down the drain to prop up this market to maintain the illusion that all is well. Almost 50% of Americans have no savings at all. The breakdown is as follows; 28% have no savings in their accounts and another 21% don’t even have savings accounts. Another survey indicates that 62% of Americans don’t even have $1000 in savings; this is certainly not indicative of an improving economy. Were it not for the stock market that is trading close to its highs, one would be hard-pressed to provide cold hard statistics supporting the assertion that the economy has improved over the past eight years. The Corporate World is also providing several signals that all is not well on the economic frontier. More companies are cutting back on their dividends, and this confirms that this economy is far from healthy or strong. Dividend players usually focus on the payout ratio as this tells you how much of its earnings a company is paying out in dividends. Many companies have payout ratios of over 40%, which is well above the historical norm of 38%, suggesting that the outlook could worsen with the passage of time. The explosive growth in the number of companies using stock buybacks to boost their EPS is a clear signal that the economy is far from healthy. None of the companies are going to admit to this in the open. One only needs to examine the massive amounts of money companies ploughed into share buybacks over the past eight years to realize something is amiss. An increasingly large number of companies would not have made their earnings nor posted gains in EPS had they not repurchased their shares. Every single year during this so-called fake economic recovery the dollar amount dedicated to share buybacks has risen and will continue to rise in the foreseeable future; it is the easiest way to boost earnings. For the past two years, corporations have spent $1 trillion on dividends and share buyback programs. At the current rate, it appears that 2016 will be on pace to set yet another record. All these factors and more would lead you to believe that the market should have crashed long ago. What gives; why are the markets trending higher. The forces behind the market are divorced from reality. It’s hot money that is powering this market and will continue to power this market, which is why this is probably the most hated bull market in the history of all bull markets. The world is embracing negative rates and so that means that even more hot money will flow into this market. It will lower the cost of borrowing, and the corporate world will go on a feeding frenzy once negative rates hit the US. Why would corporations do this? The answer is rather simple; if they borrowed so much money and continued to borrow it when rates are low; what do you think they will do when rates turn negative? They will have a field day. There is no faster way to boost EPS then by cutting the supply of the float; in other words buying back their shares. Corporate officer’s compensation is based on performance. Given this simple, legal and highly immoral solution, it is extremely unlikely they will pass up the opportunity to walk away with even bigger paychecks. This is why CEO pay continues to rise while that of the average worker drops. Even though logic dictates that this market is ready to crash and burn, it probably will not. We will witness extreme moves in volatility, and many will mistake strong corrections for crashes; Aug of 2015 and Jan 2016 are two such examples that had the bears and naysayers out in full force yelling that the world was about to end. However, on each occasion, we came out and stated much to the shock of many that no crash was forthcoming and that these corrections provided the astute investor with a great buying opportunity. The masses have not embraced this bull market, and that is why it is the most hated bull market in history and until they do we expect the markets to trend higher. However, this market will experience stronger and stronger corrections, the higher it trends, but it will not crash until the masses are finally forced to embrace this bull market. When individuals are bearish they short stocks, however, this is a contrarian indicator. A high short interest ratio is usually a bullish signal, and the current short interest ratio is very high. 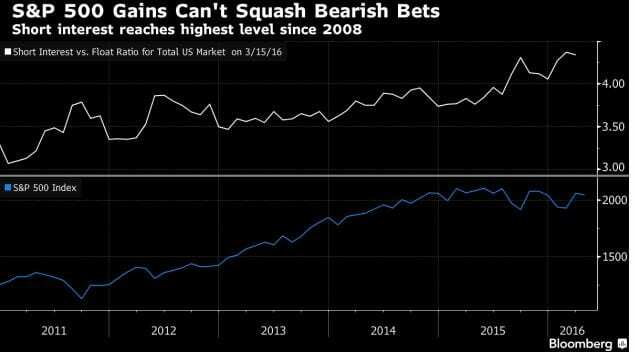 The bears are shorting the market to the tune of $1 trillion; this a great long term contrarian bullish signal. We have stated over and over again that the stronger the correction, the better the buying opportunity for a long time, most recently in Aug of 2015 and Jan of 2016. History is clearly indicative of this; from the tulip bubble to the financial crisis of 2008, the masses were always on the wrong side of the markets. The markets are rather overbought and begging for a reason to let out some steam. Overbought is simply a term that indicates that a technical indicator/oscillator has reached its upper limit. In this instance, a host of indicators are trading in the overbought ranges. It’s the month of May so the adage of selling in May and going away could come into play. Given the strong run up the markets have experienced, it is a just question of time before they start to pull back. The markets are extremely volatile so it would not surprise us if the Dow experiences a strong correction. However, do not confuse a correction for a crash. The Fed has indicated that it will do whatever is needed to keep this market afloat and maintain the illusion that all is well. They still have plenty of room to manoeuvre as we have not yet started to embrace negative rates. While logic dictates this bull should crash and burn; the forces that are driving this market do not operate on those realms.